Boots Ballot: Have you read what the PDAU are saying? It's important that pharmacists at Boots, who are eligible to vote in the recognition ballot, are well informed in order that they can make an informed decision before voting. Here you can read the latest publication sent to pharmacists at their workplaces. During this ballot campaign the PDAU have been sending publications direct to the home addresses of those eligible to vote (via the appointed independent person who is managing the process), sending items into Boots branches via the weekly red bag, as well as messaging PDAU members and making themselves available via social media and online in the company’s pharmacy unscripted forum, which is available to Boots pharmacists. We would like to invite any pharmacist still deciding how to vote, to contact us and ask any questions they feel would help them reach a decision. Boots pharmacists are also encouraged to access the pharmacy unscripted forum to read and contribute to the debate happening there. 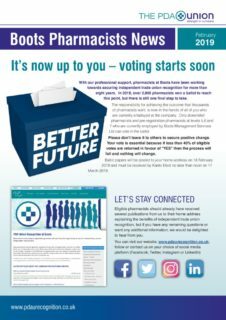 Ballot papers will be distributed to eligible pharmacists and pre-registration pharmacists at Boots on Monday 18 February 2019 by mail to their home address .